In a candid Instagram post, Irish MMA fighter Conor McGregor has reflected on his recent UFC encounter with Russia's Khabib Nurmagomedov and provided insight into his plans for the future. The 30-year-old Irish superstar vowed to come back stronger and didn't rule out that getting a rematch could take a while. "It was a great fight and it was my pleasure. I will be back with my confidence high. Fully prepared. If it is not the rematch right away, no problem. I will face the next in line." 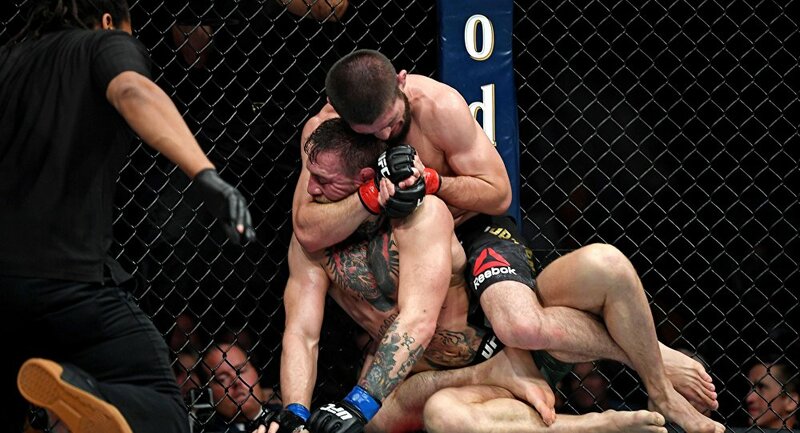 The much-anticipated UFC 229 lightweight championship bout ended in the fourth round, with Conor succumbing to a Khabib neck crank that was finished with a rear-naked choke. The Irishman, himself a former UFC lightweight champion, said that he won the first round "from a fight standpoint," while also admitting that Khabib won the first two rounds "from a sport standpoint" with his defensive tactics. He described the second round as the worst round of his fighting career. It was Khabib's deadly right hook, Conor said, that provided the pivotal moment in the fight. The Notorious conceded that he could have paid more attention to Khabib's upright fighting in preparation, so as not to end up being "beaten fair and square" in round four. McGregor's assessment of his own performance, however, was met with criticism by some MMA fans online. — . (@_PeakyShelby) 23 октября 2018 г. — jorge and 306 others (@DoUevenIiftBro) 23 октября 2018 г. Sounded like plenty of excuses, frankly. Including (but not limited to) saying that Khabib was "blessed" to land the right hand. — MMA Logic (@LogicalMMA) 23 октября 2018 г. — Iso (@Godzillaman99) 23 октября 2018 г. The Irishman's comments came days after UFC President Dana White opened up on prospects for a Conor-Khabib rematch. "I haven't even thought about a rematch," he told ESPN. "Obviously, I know Conor wants a rematch. We need to do what's right and what's fair. We'll see how it plays out. We literally haven't thought about it yet." Hours after the fight with Khabib on October 7, Conor dropped a hint that his saga with the Russian grappler may not be over yet, while not specifying the date of the rematch. — Conor McGregor (@TheNotoriousMMA) 7 октября 2018 г. However, the Russian MMA ace seems to have switched his attention to another decorated athlete. Less than two weeks after beating McGregor, Nurmagomedov called out the American boxing star Floyd Mayweather, 41, who retired from sports in 2017 after beating The Notorious. "Come on, Floyd! I am ready to go out with you to fight, 50-0 vs. 27-0," he said, referring to Floyd's 50-0 unbeaten run and his own 27-0 streak. "Two guys who never lost. Why not? Come on! In the jungle, there can be only one king, and that is me." Floyd has agreed to a match-up with Khabib: "Oh, we fighting. He called me out. So, he gotta come to my world. I'm my own boss. So, I can't say what's going on on Khabib's end. But, on my end, we can make it happen." Khabib is the first Russian to be crowned UFC champion. He claimed the lightweight title when he defeated Al Iaquinta on April 8.